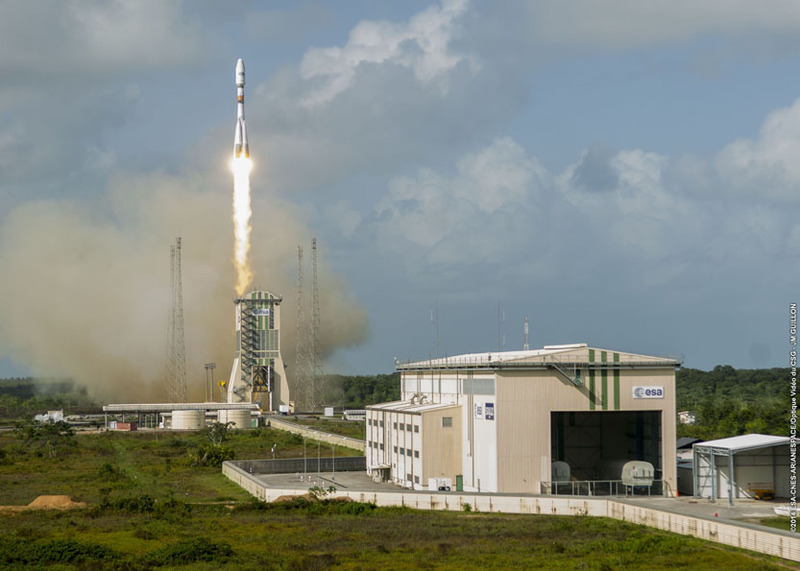 Arianespace has received its first two confirmed launch contracts for Europe’s new Ariane 6 rocket, and the company recently announced four more launch bookings to loft communications and weather satellites into orbit aboard Ariane 5 and Soyuz boosters from French Guiana. Two Ariane 6 rockets will launch pairs of Galileo navigation satellites between the end of 2020 and mid-2021, Arianespace said. The launch contractor signed the Galileo launch deal with the European Space Agency, which serves as a technical agent and developer for Europe’s navigation network on behalf of the European Commission. “Arianespace is especially proud to have won this first launch contract for the Ariane 6 from its loyal customers and partners, the European Commission and ESA,” said Stephane Israel, Arianespace’s chairman and CEO. The Galileo launches are the first two confirmed Ariane 6 reservations for Arianespace, which previously signed contract options for potential Ariane 6 flights with satellites for OneWeb’s orbiting communications constellation and Eumetsat’s meteorological fleet. The Galileo satellites will ride in pairs on two Ariane 62 rockets, the lighter version of Europe’s future launcher. 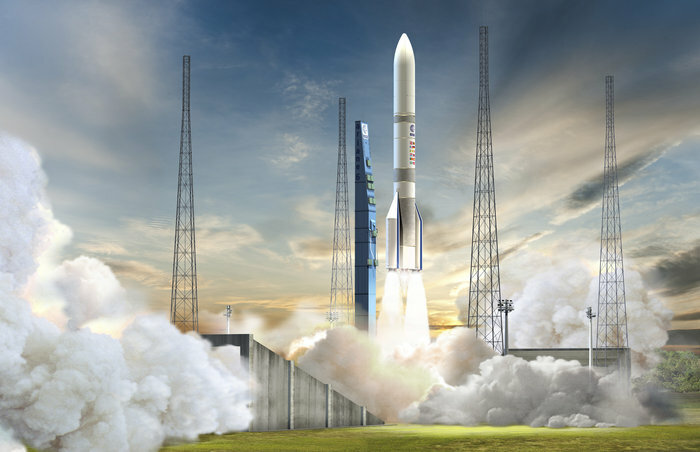 The Ariane 62 will fly with two strap-on solid rocket boosters, while the heavier Ariane 64 will carry four solid-fueled motors. The Ariane 6’s core stage will be powered by a hydrogen-fueled Vulcain 2.1 engine, an evolution of the Vulcain powerplant currently on the Ariane 5, and a newly-developed Vinci upper stage engine, also burning liquid hydrogen fuel. “We are very pleased to have earned this expression of trust from the European Commission. By choosing to continue the deployment of the Galileo constellation with two Ariane 62 launches, they become the first confirmed customer for our next-generation heavy launcher, which is slated to make its initial flight in the summer of 2020,” Israel said in a statement. 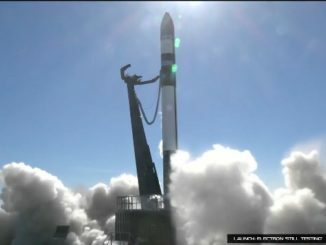 Eighteen Galileo navigation satellites are currently in orbit. Eight more spacecraft will join the fleet over the next year with two Ariane 5 rocket missions scheduled for Dec. 12 and mid-2018. Like the Ariane 5 rocket, the Ariane 6 will inject the Galileo satellites, built by Germany’s OHB with major contributions from Britain’s SSTL, directly into a circular orbit more than 14,400 miles (23,200 kilometers) above Earth after liftoff from the Guiana Space Center on the northeast coast of South America. The agreement has an option to launch the Galileo satellites on Soyuz rockets from French Guiana if the Ariane 6 is not ready in time. Ariane Group, a joint venture between Airbus and Safran, is developing the Ariane 6 rocket to replace the Ariane 5 in a public-private partnership with the European Space Agency. Officials say the Ariane 64 version will sell for around $130 million per flight, according to a recent presentation to Ariane customers, a price to be typically shared by two customers on dual-payload missions. The Ariane 64 will deliver up to 20 percent more payload to geostationary transfer orbit, a high-altitude destination used by many commercial communications satellites, than the Ariane 5. And it will take less than two weeks to prepare for a launch, down from the month or more needed to ready an Ariane 5 flight. The European Space Agency and the European Commission have agreed, in principle, to use the Ariane 6 rocket at least five times per year for “institutional” missions, which include environmental monitoring, government communications, navigation and scientific payloads. 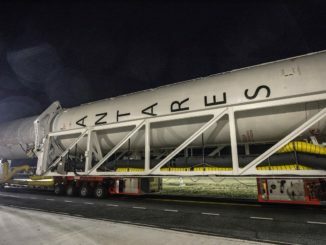 Arianespace will seek to fill out the remaining Ariane 6 manifest with commercial customers, for a total of up to 12 Ariane 6 flights each year. The other contracts announced last week by Arianespace are for SES and Eumetsat, a global commercial telecom satellite operator and Europe’s weather satellite agency. Four O3b medium-altitude broadband satellites owned by SES will launch together in 2019 on a Russian-built Soyuz rocket from French Guiana. Three previous Soyuz missions deployed 12 O3b satellites in 2013 and 2014, and another O3b flight was already booked with Arianespace for a Soyuz launch in early 2018. The next four O3b satellites were already expected to launch on a Soyuz, but the firm contract was not unveiled until last week. The O3b satellites, manufactured by Thales Alenia Space in France, orbit around 5,000 miles (8,000 kilometers) over the equator. SES also finalized a deal to launch the high-power SES 17 geostationary communications satellite on an Ariane 5 rocket in 2021. 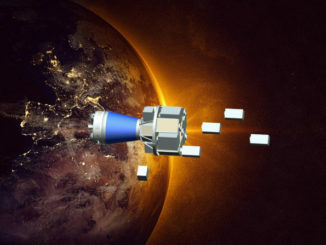 Built by Thales Alenia Space, SES 17 will carry an all-electric propulsion system and provide in-flight connectivity and data services over the Atlantic Ocean and the Americas. SES 17 will weigh more than 6 metric tons, or 13,000 pounds, at launch. That mass makes it suitable to ride in the upper position on a dual-payload Ariane 5 launch. Two next-generation polar-orbiting weather satellites for Eumetsat will also fly into orbit on rockets sold and managed by Arianespace. The first two Metop-Second Generation, or Metop-SG, satellites will launch on Soyuz boosters from French Guiana in the 2021-2023 timeframe, Arianespace and Eumetsat said. The Metop-SG A1 and Metop-SG B1 satellites will carry optical and microwave meteorological sensors, respectively. The final first-generation Metop satellite will deploy into polar orbit approximately 500 miles (800 kilometers) above Earth on a “Europeanized” Soyuz rocket launched from French Guiana late next year. While Eumetsat is an institutional customer, the weather agency awards launch contracts through open competitions. The Soyuz contracts for the agency’s first two Metop-SG weather satellites were signed after a competitive procurement, according to Marc Cohen, head of Eumetsat’s low Earth program programs. Eumetsat also arranged a contract option for the third Metop-SG weather satellite to launch on a Soyuz or Ariane 62 rocket. The batch of contracts were announced last week in conjunction with Euroconsult’s annual World Satellite Business Week meeting in Paris. Financial details of the agreements were not disclosed.